As anyone who has chickens in an urban setting knows, the big enemy are rats. They’re cunning and determined, and given a chance they’ll eat all the chicken feed, and anything else they can find. Three years ago we ran wire underneath the whole chicken run, in order to keep the rats out. The wire has held up very well, but there’s been a renewed push from the rats in recent months. This includes creating a number of underground tunnels and burrows, testing whether they can get access from underneath. Concerned that they would become motivated enough to chew through the wire (which they can! ), I decided to implement a more permanent solution. Clearing back down to the chicken wire base. The first step was to clear down to the layer of chicken wire running across the bottom of the chicken run. Wire mesh in place as reinforcing for the concrete slab. I then laid down a grid of galvanised iron, to provide reinforcing for the concrete slab. This is held off the ground by a series of spacers. The day before I’d headed to the local hardware store, and picked up fourteen bags of ready-mix concrete (thank goodness I’ve now got a ute!). The concrete slab, just poured. I mixed the concrete in my wheelbarrow, 2-3 bags at a time. In total, the whole process took about four hours, from the initial clearing through to a freshly-poured slab.The total cost was about $160, including the concrete and wire. It was also good exercise! The concrete slab in action. At first the chickens weren’t sure about the slab, and were hesitant to walk on it. They’re over that now. The plan is also to progressively pour further slabs, working up the chicken run. Update: within 24 hours the rats gnawed a hole through the wire above ground to get in to the chicken run. Doh! Further reinforcing has been done, and I’m going to pour a little more concrete in some key areas of weakness. This entry was posted in Growing our own food and tagged chickens, rats. Laying down wire underneath the full length of the chicken run, to keep out the rats. “Rat cunning.” It’s an expression you hear, but you don’t fully understand until you see them in action. 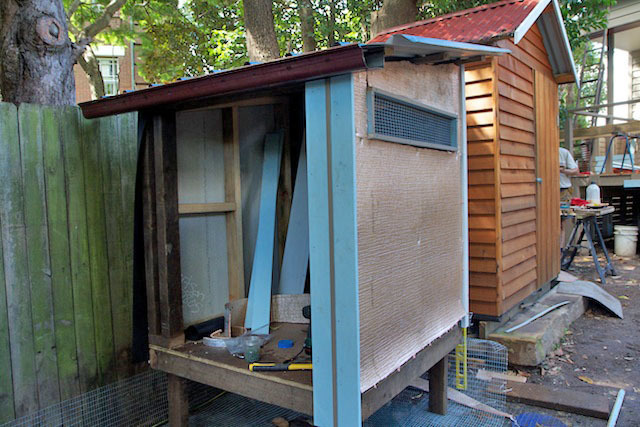 When we created our chicken run, we ran aviary mesh up the sides of the run, and chicken wire across the top. Old concrete garden edges were dug 30cm into the ground on all sides, locking down the wire. We thought it would be enough to keep out the rats. Boy were we wrong! While the the chickens themselves were safe in their Fort Knox of chicken coops, the rats were scavenging any feed scattered about by the hens. So I spent the last few weekends digging up the chicken run, laying down wire, and then cementing in the gaps. A lot of work, but hopefully the chickens should be safe now. Of course, the wire will rust away in a few years. Had we known what we know now, we’d have bitten the bullet and laid a concrete slab when we created the run. Still, this should last a while. And maybe when these defenses fail, I’ll be feeling more enthusiastic about laying a slab. The take-away message: don’t underestimate rats, particularly when you live in the inner-city. This entry was posted in Growing our own food and tagged chicken coop, chicken run, chickens, pests, rats. Our three girls, happily clucking around the chicken run. With the house renovation essentially finished, our attention has turned to the garden. The highlight so far is adding chickens to our family, an essential part of any inner-city permaculture system. The photos in this post show key steps of the construction process. 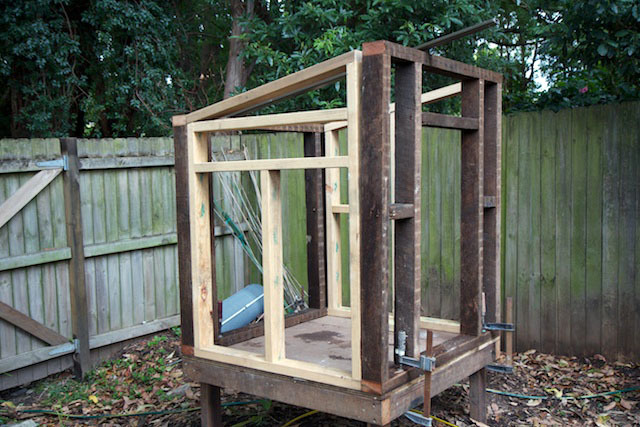 This is one massively over-engineered chicken coop, which all comes down to the mindset you have when starting the project. 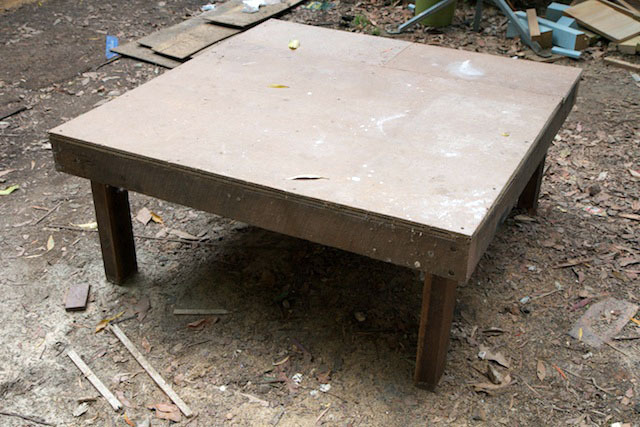 If you’ve come from a bit of light DIY, then you build something simple. If you’ve come from six months of building a house, as we have, then you build … a small house. 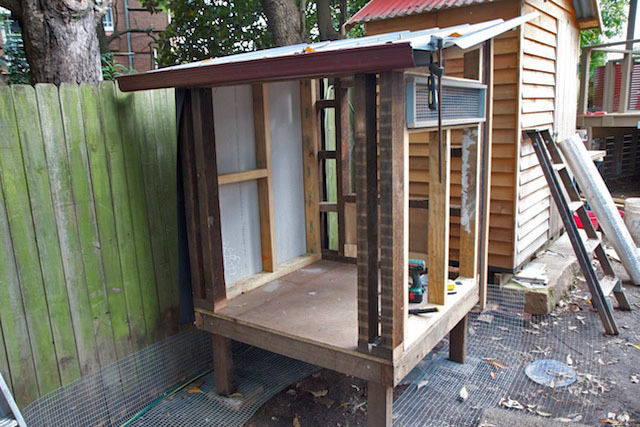 The coop sits on a base frame of recycled hardwood, 500mm above ground level. This gives some protection against rats, termites and general rotting. It also gives the girls somewhere to shelter from the sun and rain, and they spend a lot of time napping under the coop. The coop is quite high, for no real reason other than avoiding the need to crouch when cleaning it out. The nesting boxes are made out of recycled eco-ply from the kitchen, and they give easy external access (for when they finally decide to start laying!). An old curtain rail provides a roost, and they happy put themselves to bed each night. The coop is connected to a chicken run beside the fence. By working against the boundary, only two new fences needed to be built. Learning from the nuns next door, the run is built like fort knox, to protect against foxes (oh yes! ), rats (heaps) and scavenging birds. 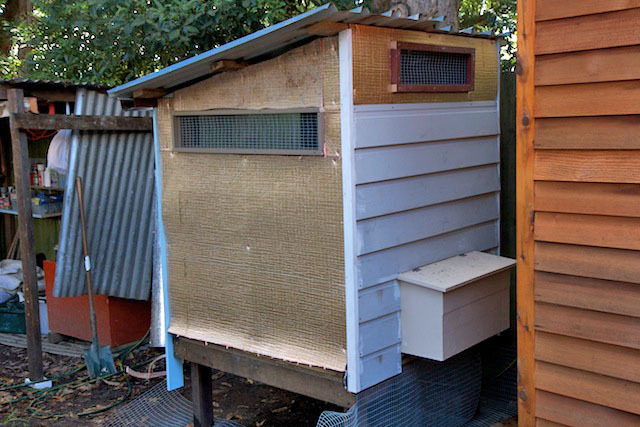 This includes aviary mesh on the sides (tucked underground and weighed down with old concrete garden edging), and chicken wire across the top. Every gap has been plugged to the best of our ability. The feeder and water are all suspended off the ground, again for proof against rats. While we lock them up in the coop each night, the run is secure enough to leave them out if we have to go away for a week. We now have three chickens happily clucking around. Two Isa Browns, and a “something else” (inherited from relatives). No eggs as yet, but the Isa Browns are still very young, and the older bird was moulting when we got her. Framing for the walls, just like a house 🙂 Made of reused 90×45 oregon and pine. The coop moved into place beside the fence, before it gets too heavy! The back wall has gone on, and the first window constructed. We had left over insulation, so might as well use it! 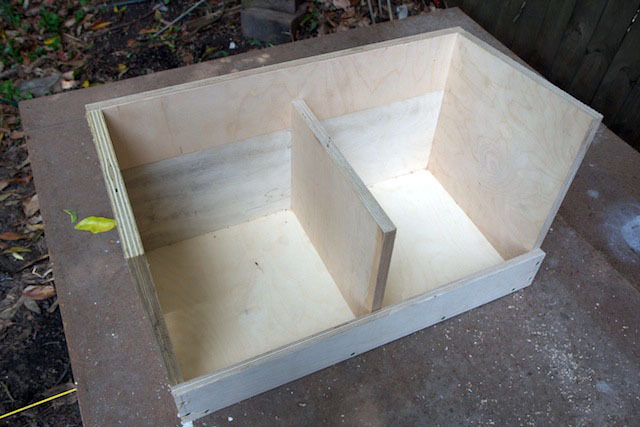 The construction of the nesting boxes, made from eco-ply. Apparently you need one per five chickens, so we have room for the flock to grow! The outside being clad in Weathertex watherboards, to match the house. Ok, we know that’s going overboard! Almost there! 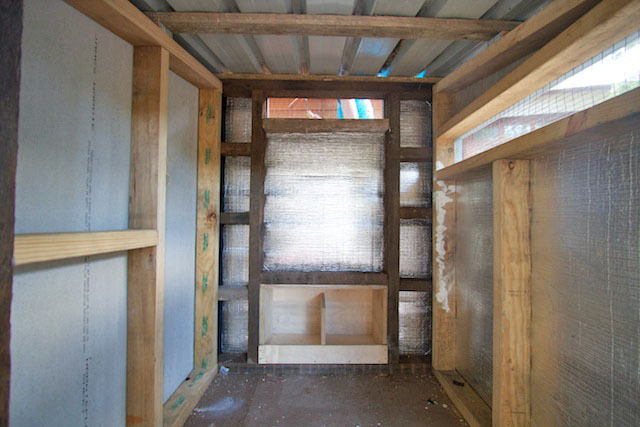 Just the inside walls to be done, reusing some left-over plywood sheets. This entry was posted in Growing our own food, Renovating the house and tagged chickens, coop, eggs.